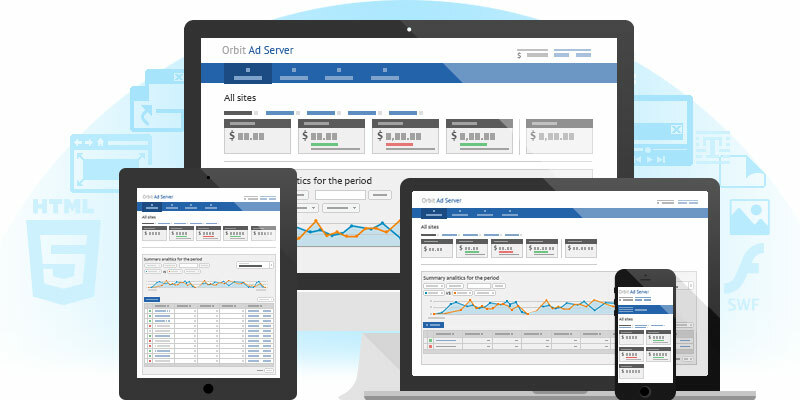 With a simple interface and efficient design, OrbitSoft Ad Server technology manages your online advertising, measures the success of each campaign and helps you maximize the return on each investment. Set your own rules for inventory: who can buy it and at what price? You decide which ads to display on which websites with just a few clicks. Enjoy one-click easy targeting options and detailed analytic reports that minimize your time needed and maximize your revenue earned. OrbitSoft Ad Server for Agencies guides you through the user interface, so you avoid wasting your time looking and can properly allocate more time to finding the right ad placements and target audiences. Reports allow you to see what’s working and what’s not dynamically in real time. With OrbitSoft Ad Server, advertisers can upload, preview, and configure rich media, video and mobile ads as easily as regular display ads. Our social media component also allows close cooperation with clients. Dynamic Reports are available for each user with OrbitSoft Ad Server in real time. The software covers all of your campaigns, groups, ads, sites and ad space. Users have the ability to generate reports on any given parameters with flexible settings by date range and report fields in offline mode, or with powerful report templates as an automated service defined by their own scheduling. OrbitSoft Ad Server provides powerful analytics visualized as interactive graphs, charts, heat maps, and diagrams to simplify analysis and make evaluating Ad performance even faster. OrbitSoft Ad Server billing offers simple navigation, filtering options, and easy-to-see summaries of all your important billing and payment information. See full detailed list of OrbitSoft Ad Server features (PDF). Monetize your iPhone, iPad, Android, Windows phone, and other mobile traffic by serving ads specifically for those devices and each types of brand customer. A wide range of video ads including overlay videos, tickers, and other rich-media, online video content with no technical burden for you or your publishers. Promote products using the same form as an article written by the editorial staff. Native advertising is a type of online advertising that matches the form and function of the platform on which it appears. Algorithms analyzing your webpages to highlight keywords and display ads based on visitors’ immediate attention. Allows your advertisers to capture an audience who has already visited their websites in the past. Allows you to make good decisions based on system information, profit forecasts, and system operation efficiency. Advertisers can track conversions on their webpages and apps with JS/S2S code that tracks and calculates conversion rates. Allows you to create different roles and set access rights for system users. You can create roles for different workers at your agency or network and enable or disable access as you need. Sell your Ad inventory and display Ads of third-party networks via API XML/JS Tags or OpenRTB.